Wow, what a record-breakingly amazing time we had at BUST magazine's Summer Craftacular! It was the event of the season for London's craftsters, with queues of 500 people going right down the Cambridge Heath Road! Last week we were busy preparing our gigantic record table, with matching 7"-topped stools. The table looked great in the centre of the beautiful old York Hall. We raided our archives of amazing acrylic shapes and put them all out on the table in bowls made from vinyl records! We gave away empty bracelets that people could then fill up with charms. The lucky crafters who arrived first got the pick of the pieces: 3-d glasses, glitter stars, astronauts and plastic streamers. They also got Tatty Devine goody bags! Everyone got to practice their jewellery making skills first by helping add charms to our HUGE charm bracelet. At the end of the day, we were invited up on stage to show everyone the bracelet, while they played the 'Record Breakers' theme tune! We are now busy counting the charms (and planning a competition where you get to guess how many there are...). We'll also be submitting it to the Guinness Book of World Records (fingers crossed!). Rosie span a few real records for her girl music DJ set. 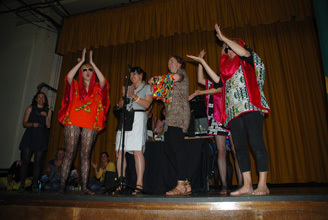 The other DJs were fabulous too, and there were so many amazing stalls! 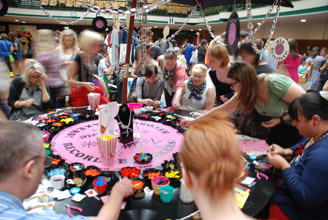 Thanks to all the Craftacular girls and everyone who came for making it such a fun, brilliant event. Now go break some records! See the rest of the photos on our flickr.